Constructed of 16 gauge type 304, 16 gauge type 304 stainless steel. 1-1/2" roll on front, with 1-1/2" upturn on rear and ends. 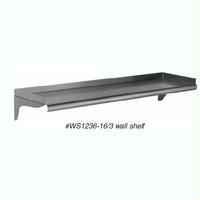 Stainless steel mounting brackets are stud welded to shelf.